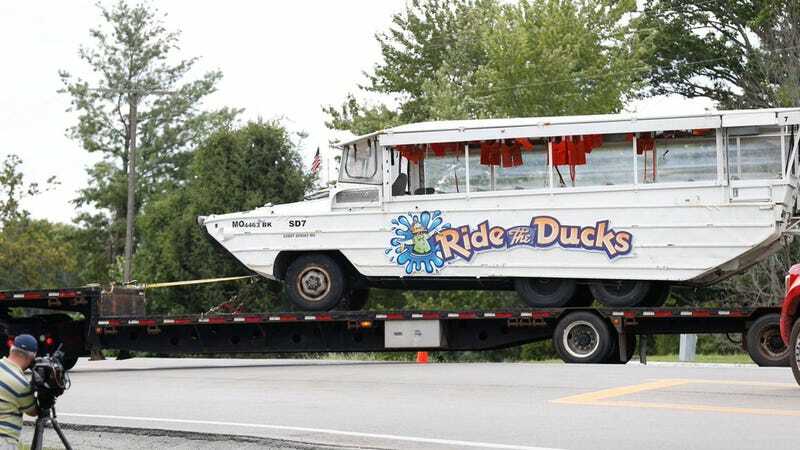 Recording media including an SD card and a removable hard drive from the vehicle’s digital video recorder camera system were recovered by divers before the duck boat was salvaged. · The audio quality varies widely throughout the recording, affecting the intelligibility of what is spoken. · About 18:28:00. The crew was told to take the water portion of the tour first, by an individual who briefly stepped onto the rear of the vehicle. · About 18:29:13. As the passengers were loading, the captain made a verbal reference to looking at the weather radar prior to the trip. · About 18:33:10. The driver stated a passenger count of 29 and shortly after, the vehicle departed the terminal facility. The captain narrated the tour while the vehicle was in motion. · Starting about 18:50. In the vicinity of the boat ramp, the captain began a safety briefing regarding the water portion of the tour. The briefing included the location of emergency exits as well as the location of the life jackets. The captain then demonstrated the use of a life jacket and pointed out the location of the life rings. The captain moved into the driver’s seat and the driver moved into the seat directly behind. · About 18:55:20. The captain announced to the passengers that they would be entering the water. The boat entered the water. The water appeared calm at this time. · Between about 18:56:22 and 19:00:38. The captain allowed four different children to sit in the driver’s seat, while he observed and assisted. · About 19:00:25. Whitecaps rapidly appeared on the water and winds increased. · About 19:00:42. The captain returned to the driver’s seat. The driver lowered both the port and starboard clear plastic side curtains. · About 19:01:01. The captain made a comment about the storm. · About 19:03:15. The captain made a handheld radio call, the content of which is currently unintelligible. · About 19:04:15. An electronic tone associated with the bilge alarm activated. · About 19:05:21. The captain reached downward with his right hand and the bilge alarm ceases. · About 19:05:40. The captain made a handheld radio call, the content of which is currently unintelligible. · About 19:07:26. An electronic tone associated with the bilge alarm activated. · 19:08:27. The inward-facing recording ended, while the vehicle was still on the surface of the water.